Etiquette expert Jean Papalia demonstrates how not to use utensils. 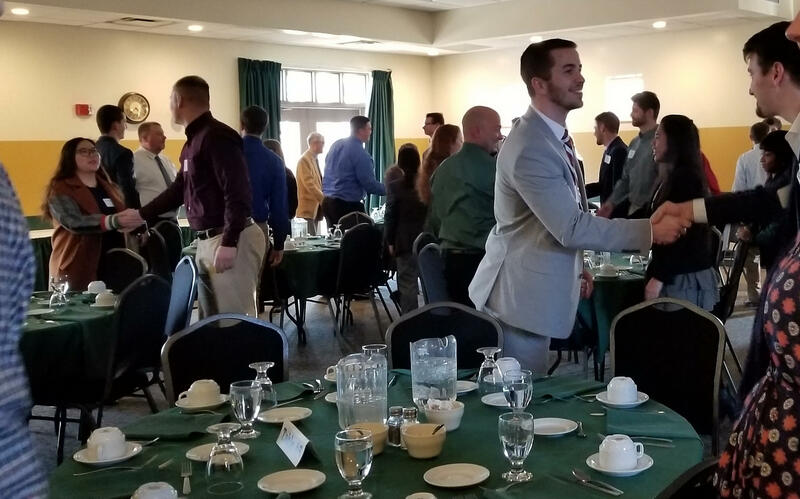 With college graduation just weeks away, newly minted professionals across the country will be having meals with prospective employers or attending company meet-and-greets. Do you know where your fish fork is? How about your dessert fork, seafood fork and salad fork? One college in Bangor is determined that its grads are prepared for these kinds of social situations. Etiquette was a big thing back in the ’40s and ’50s. Family dinners were more commonplace back then, and high schools and colleges also took it upon themselves to show social hygiene films, with lessons on how to answer the telephone or ask someone on a date. In one 1945 film, we meet Bob, who blunders his way through a dinner party. “Bob is hungry, and the soup looks good, but as we see, he’s doing at least three things wrong,” the narrator says. Bob has started eating before his host has picked up her spoon, he’s using his spoon like a shovel and he’s hunched over his bowl like it’s trying to get away from him. According to etiquette expert, Jean Papalia, all three of these behaviors are still wrong. Papalia leads a session of dinner etiquette training at Husson University in Bangor. She received her etiquette training at the Emily Post Institute in Vermont, directs the career center at Tufts University and is principal of A+ Etiquette, which teaches professional manners. Jean Papalia answers students' questions and coaches then through dinner. “Employers are confident in the skills that students are going to bring to their jobs in terms of their work skills, but they’re a little bit less confident about the business social skills they’ll have,” she says. It’s not just about knowing which fork to use, says Papalia. It’s also being aware that no employer wants to expose clients to a colleague who gets tipsy at dinner, makes inappropriate jokes or picks his teeth at the table. She says good etiquette isn’t about having Downton Abbey-level comportment, but with families as busy as they are, many kids these days aren’t even learning the basics, and that could hold them back. Students practice being hosts, guests of honor, and meeting others with a proper handshake and an introduction. That brings us back to Bob. “The waving of his knife and fork about. Talking with food in his mouth. Monopolizing the conversation and then — uh oh,” the narrator says. Bob has knocked over his water glass. “This isn’t the kind of ending to the story that Bob had in mind. At least it stopped Bob from making any more mistakes,” the narrator says. 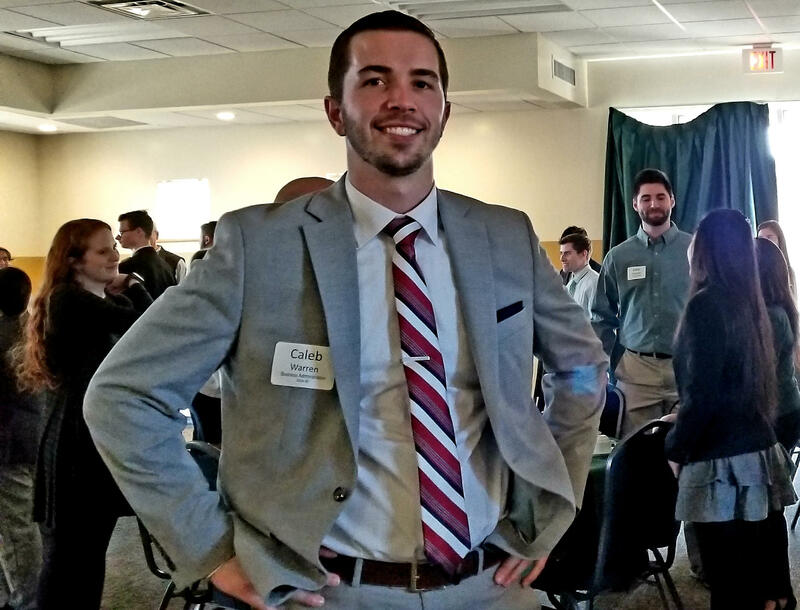 Caleb Warren, a senior studying business administration, says he is determined not to be “that guy.” He has attended the etiquette dinner twice now, and says he’s already putting what he’s learned into practice. The students work their way through a four-course meal, and aside from a little spoon confusion and an incident involving the sour cream, they’re all doing better than Bob. Papalia circulates the room to answer questions: Is it OK to leave lipstick on a glass? What if you have to take medication with your food? And how do you politely remove a pit or a bit of gristle from your mouth? “Going through something like this would be helpful to a majority in our country,” says Husson career development head, James Westhoff, who organizes these evenings. Westhoff says it’s just part of helping kids prepare for a challenging world ahead. 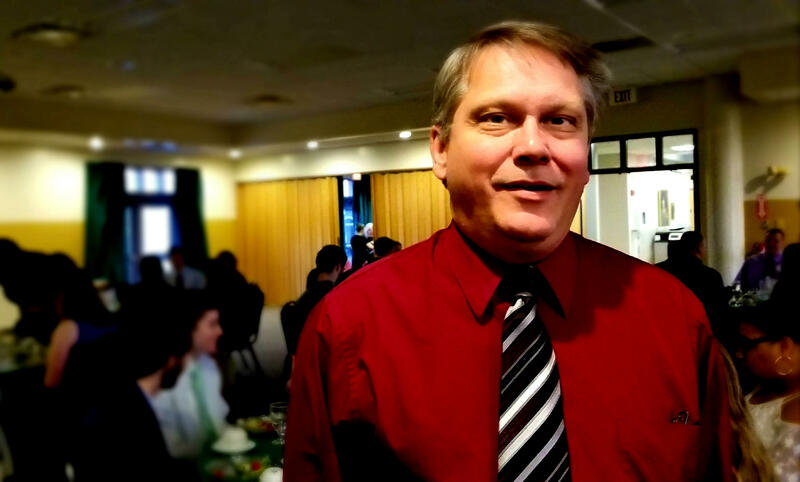 A self-described introvert, Westhoff says he knows how tough it can be to chitchat to a stranger at a party, or stand up and make a toast at a large gathering. Westhoff says part of the training recognizes that, try as you might, you will embarrass yourself on occasion, as he once did at a job interview over a seafood lunch. Turns out he got the job — which means there’s hope for Bobs everywhere.